is responsible for notifying actors (885) (q.v.) and other performers shortly before they are due to appear on the stage; calls the half-hour, quarter-hour and five minutes before the curtain goes up; in film producing, calls out names of cinema actors and actresses (885) (q.v.) in dressing-room corridors when time has come for their appearance in scene. regulates electric motor operating machine which projects cinematographic picture on to screen, or, in small provincial theatre, operates machine by hand; exhibits lantern slides of announcements, advertisements, etc., during intervals iu show; adjusts lantern and projector to correct focus and illumination; fits in spools and rewinds projected spools, when not so assisted by cinematograph learner (q.v. ); carries out necessary minor repairs to apparatus; is sometimes a skilled electrician (307) (q.v.). helps cinematograph operator (q.v.) by arranging spools of films, lantern slides, etc., in sequence for projection; also operates machine in operator's absence; repairs broken films with gum; takes off, from machine, spool containing film which has been shown on screen, and rewinds it on another spool, by hand; hands fresh spools of film to operator, and stores away projected films. is employed for a few hours in morning to clear stage and remove scenery after previous night's performance and to set scenery for next performance. assists actors (885), actresses (885), and music hall artists (885) (q.v.) to change their costumes; keeps costumes in order and ready for use; is sometimes a sewing woman (405) (q.v.) and does minor repairs; in case of music hall artists or touring companies, is responsible for packing and care of luggage. operates, under direction of head flyman (q.v. ), overhead appliances for raising and lowering of scenery by means of pulley ropes; works in flies. is in charge of flymen (q.v.) and himself helps to operate overhead appliances for raising or lowering scenery. 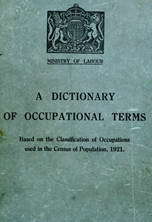 has charge of and manipulates lantern, on perch or standard in wings of stage or back of auditorium; casts "spot" light on performers; throws beam of coloured light on stage by inserting slides in lantern; is generally a qualified electrician (307) (q.v. ); in small provincial theatres, duties are usually performed by cinematograph operator (q.v.). stands in wings of theatre to prompt when an actor (885) (q.v.) forgets his lines; in opera, reads sotto voce and continuously the whole libretto, from stand in front of footlights; in theatres, prompting is usually done by assistant stage manager (880) (q.v.). sets and clears stage of properties either under direction of master carpenter (474) or property master (q.v. ); in film studio, is in charge of wigs, clothes, furniture and other properties and issues or procures them as required. is responsible for the safe keeping, issue, repair and, sometimes, making of stage properties; superintends setting and removing of properties. removes scenery and places fresh scenery in position, when required, at a theatre, music hall, film studio, etc. has charge of and keeps in repair stage machinery; supervises working of winches, pulleys, trap doors, etc., used on stage at theatre, music hall, etc. ; is usually either a master electrician (307) (q.v.) or master carpenter (theatre) (474) (q.v.). has charge of stage wardrobe of female members of theatrical company, and sometimes does minor repairs thereto, or has one or two dressmakers (405) (q.v.) working under her to do such repairs; in costume plays, also has charge of stage wardrobe of male members.